From the poshest hotels to the hottest clubs – Las Vegas has it all! When it comes to golf courses, Sin City also has the best. In fact, the city houses some of the most beautiful and luxurious golf courses in the world. Whether you’re an amateur or an expert, these Vegas golf courses will surely take your breath away and strengthen your passion for the sport. A fixture on the world’s best golf course list, Shadow Creek is a 350-acre terraformed desert that famous Tom Fazio designed for Steve Wynn in 1989. The course was once only accessible to VVIP guests of the Mirage Hotel & Casino but is now available to all hotel guests but for a fee. Elegant, lush, and relaxing, Shadow Creek, located NE and North Las Vegas, should be one of your first golf stops when in the city. Another stunning golf course found in Vegas is Cascata. Located 30 miles past Vegas, Cascata highlights the natural beauty of the desert landscape alongside the greens creatively designed by Rees Jones. The course also features a massive, man-made 418-foot tall waterfall that shifts into a river and flows through the luxurious clubhouse. Aside from its beauty, Cascata is loved by golfers because of its illusory slopes, expertly trained caddies, and above par service. Mesmerizing green rolling hills in the desert? Yes, it’s possible! Thanks to Steve Wynn and Tom Fazio. 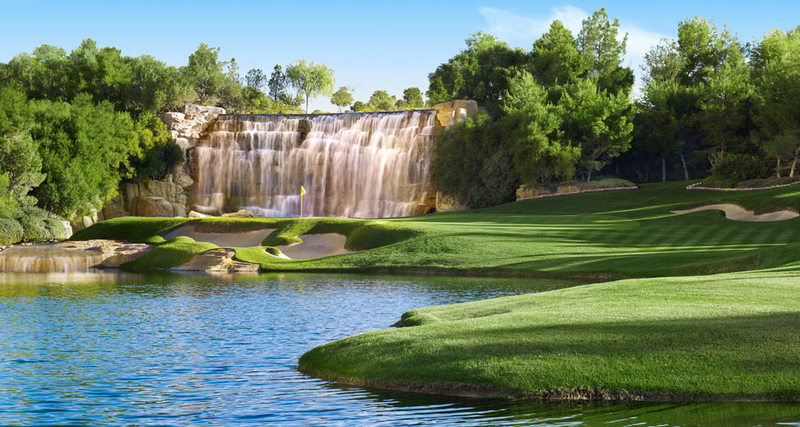 The duo created the Wynn Golf Course with opulent beauty in mind and they obviously succeeded. This golf course is also known for its incomparable service and convenience. Unlike other courses that are strictly exclusive, one doesn’t have to be a guest at the Wynn Hotel or even have the complete gear to be able to play. Just pay the greens fee and you’ll be presented with your Foot Joy shoes and Callaway Clubs for the day and you can start conquering the greens. Now that you know where the best and most beautiful golf courses are in Vegas, you can play a round of golf whenever you feel like it. Eliminate any hassle during your trip with the help of Earth Limos & Buses. Your friendly chauffeur can help you load your golf bag in the vehicle and take you to your golf course of choice on time and in style. Call up Earth Limos & Buses at 725-777-3333 and ask about their different offerings.